A few weeks ago I found out about the annual Knitting and Crochet Blog Week, where every participating blogger writes about a set topic each day for a week. Yesterday the blogging topics were published and I can't wait to give it a go! I'm really excited about trying out blog week because it will challenge me to write a blog post every day for a week, and because it gives me topics I wouldn't have come up with myself. I'm also looking forward to coming across a few new knitting blogs during the week! 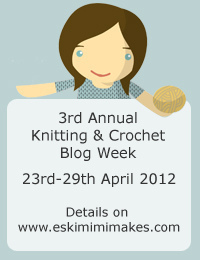 Blog Week 2012 takes place from the 23rd-29th April, which gives me three weeks to get in the habit of posting regularly. I haven't posted for the past two weeks as I was travelling: first to Paris, then to Aix-en-Provence in the south of France for a college football tournament, with an essay to write in between. Paris was incredible, the tournament went well, despite the 12-hour overnight bus journey there and back, and the essay was handed in on time!